Chicago Food Machinery came to fruition as a result of a vision; one that wanted to pay tribute to the true Chicago-based traditions of quality delicatessens. The founder of Chicago Food Machinery, a long time admirer of the authentic delicatessen experience, wanted to bring this same familiarity to the masses. Whether you're a hometown restaurant owner, starting a mom & pop deli business, or homeowner looking for quality, top-of-the-line commercial products - Chicago Food Machinery will assist you with your needs. 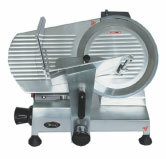 Our manufacturer has produced quality deli grade slicers for over 20 years. Slicers range from smaller footprint models (for more compact areas) to a fully automatic electric slicer. All of our deli slicers adhere to the highest standards of safety with automatic shutoffs and other safety measures. The dense alloy and heavy duty construction promotes years of usage and further ensures the already professional level of design and construction. Chicago Food Machinery further enables the small business to succeed via our professional heavy duty commercial blender. This stainless steel blender blasts its competition away with its 3 HP (at peak) motor and 1,500 watt performance. This workhorse is perfect for juice bars, bistros or simply an at home margarita night. From the corner cafe to the bustling delicatessen to your very own kitchen - Chicago Food Machinery products are designed to support your quality machinery needs.